The Ultimate Pressure-Cooker Cookbook Nobody knows more about pressure cookers than Vickie Smith, creator of the leading pressure-cooker Web site, MissVickie.com. Now, at last, Miss Vickie has gathered all of her pressure-cooker wisdom into a book. Whether you’re a pressure-cooker newcomer or a longtime fan, you’ll find all the recipes, techniques, and tips you need for a lifetime of great pressure-cooker meals. 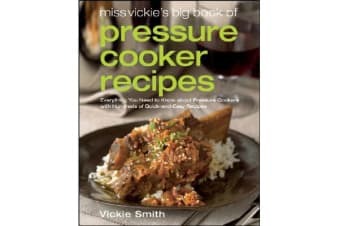 Miss Vickie’s Big Book of Pressure Cooker Recipes is jam-packed with nearly 400 fast, tasty, foolproof recipes, ranging from one-pot meals like Chicken and Rice with Mushrooms to Sweet and Sour Pork, Navy Bean Soup, and Chocolate Malt Cheesecake. Miss Vickie’s detailed recipe instructions and special techniques, such as “pan in pot” pressure cooking, guarantee that each dish comes out perfectly cooked—and perfectly delicious. But Miss Vickie gives you more than just great recipes. Her book also provides in-depth guidance on every aspect of choosing and using a pressure cooker, including: A buyers’ guide to modern pressure cookers Step-by-step pressure-cooker instructions Pressure-cooker safety Basic and advanced pressure-cooking techniques Common mistakes in pressure cookery Adapting recipes to the pressure cooker Tips, tricks, and troubleshooting Offering hundreds of recipes that are proven to work—and proven delicious—plus plain-English answers to all of your pressure-cooker questions, Miss Vickie has created the single most useful pressure-cooker book ever published. It’s a resource you’ll turn to again and again as you explore the world of pressure-cooker possibilities and pleasures.